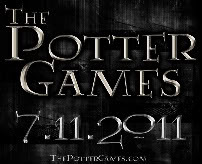 So now that you all know what The Potter Games are, How are you guys liking it? There are more and more characters that are coming available to play every day, and what is fantastic is that each character has a different story, all written by different people with different writing styles. So how did I come to be involved? Well, HG Fireside Chat host Adam Spunberg asked me one day if I would be interested in participating in a Hunger Games/Harry Potter project. All that went through my head was "HELL TO THE YES!" For a long time I have been doing nothing but pining over my favorite two book series in the world: Harry Potter and Hunger Games. They have some really interesting things in common, and do the utmost job of storytelling. I didn't care what I did, I just knew I wanted to be a part of it. The next few weeks were full of endless emails, researching, and hours spent writing. 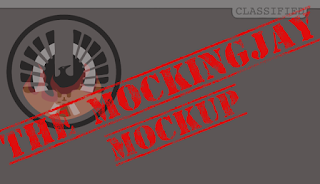 I went to school and interned in the graphic design industry, so I thought that was pretty much all I could offer. Before I left a chat room one day, Adam asked me to pick a character to write. Despite the fact that I hardly ever write, here was legendary host of the Fireside Chat telling me to pick a character! What was I to do? Well, I could not let Adam down. Oh no, I was determined to deliver. So what character to choose? Well, choices were smaller characters and Harry Potter. I admit I was not confident enough in my writing ability to take on the Boy Who Lived. So I went with Lavender Brown. Why? Because in my book, she's adorable. Sure she was a little irritating for the short time she was with Ron Weasley, but she was annoying in a hilarious silly girly girl way. 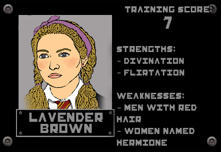 So my research began on Lavender Brown. It seems a lot of people aren't thrilled with Lavender as a character, but I encourage everyone to give her a chance. She's innocent in all of this! I guarantee a fantastic ride of alliances, magical creatures, thrilling scenes, villians and an epic conclusion!